Our journey began in the Reactor Parking lot where we met Mom and Dad – a Chrysler Town&Country (Mom) and a Ford Escalade (Dad) awaited as our chariots. It only took a few curb checks to learn the ropes. What we hoped would be two fully packed cars would change as we sadly were given the news that two of our participants, Mary and Witt, would not be joining us. Due to unpreventable circumstances both of them had to drop the trip last minute, leaving the Beignet Baes down to 10. Witt and Mary will always be Baes in our hearts, and we hope to buy them a few souvenirs along the way during the trip. After slumber partying at Lauren's 2 man apartment, you can say things were a bit ~cozy~, the baes were up and ready for our 6 am departure. 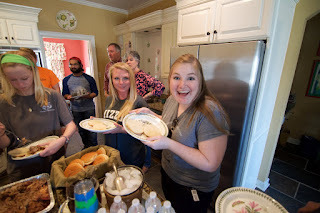 While Mom and Dad were noticeably lighter than anticipated, we were still looking forward to stopping for lunch at Witt's family home in Memphis as his parents offered to still feed us lunch even with the absence of their son. Not going to lie, we were worried this might be a little awkward. Pulling up to the neighborhood, the only reason we knew we had arrived, aside from like the address and such, was because Mrs. Wells was standing outside taking photos of us from her front patio. Mr. and Mrs. Wells, as well as Witt's sister Georgiana, are the most generous, hospitable people we have ever met and were more than happy to feed a few volunteers donating their spring break to service as they traveled through town. One of the most memorable moments of this trip so far was when Adam and Mackenzie sat at the Wells' grand piano and played some beautiful music for our group to sing along to. Literal tears at the beautiful family moment. Mrs. Wells was grinning ear to ear with the love resonating in that parlor room. Mrs. Wells then offered a prayer to us, which was extremely powerful, to our participants of any religion. We were truly lucky to have this amazing opportunity and tasty Memphis BBQ. We got back on the road. Quick bit of advice, if you ever have a Canadian vehicle, or any other vehicle aside from America, please make sure you are looking at miles/hour and not kilometers/hour. You will be on the freeway going 40 miles/hour, and people will be giving you weird looks as they zoom past you at the posted 70 MPH limit. We aren't saying we experienced this, but we aren't saying we didn't. After sunset, we finally arrived in the New Orleans city limits. We were greeted at our housing by Antoinne, our next door neighbor who is our housing's guardian angel, but also a bit confusing. He was a "character" to say the least. We thought we had all personalities on the trip, but he introduced a fresh face to us and he sure did bring us some laughs. Let's just say, if Antoinne was a color, he'd be the rainbow, because he had it all. We then set out for groceries, which was an experience in itself, which using English 1000 skills, we should have seen the foreshadowing. When talking to Antoinne, someone explained, "We are actually going to go get groceries!" and then Antoinne exclaimed, "No you aren't! Everything is closed." Well us college town kids surely know that Wal-Mart is our friend, so we set out to the Wal-Mart Supercenter 15 minutes away. Well, when we got there at 10:53 pm, we were hanging around and getting produce, as an announcement comes on. One our participants Robbie said, "Guys, I think this is closing…" as Mehdi says, "It's Wal-Mart, it doesn't close." Well, let's just say after the confirmation that we indeed had 7 minutes before the 11pm closing time, everyone split into threes. "Toilet paper!" "Breakfast!" "Blankets!" we all shouted as we ran through the store. Fast forward, we walk with breakfast food and TP in hand. Call us Mission Impossible, or Mission Possible, am I right, baes? Tomorrow's Agenda: Easter. Grocery shopping. Parade. Beignets. Fun. Keep up with us, because we can barely keep up with ourselves!